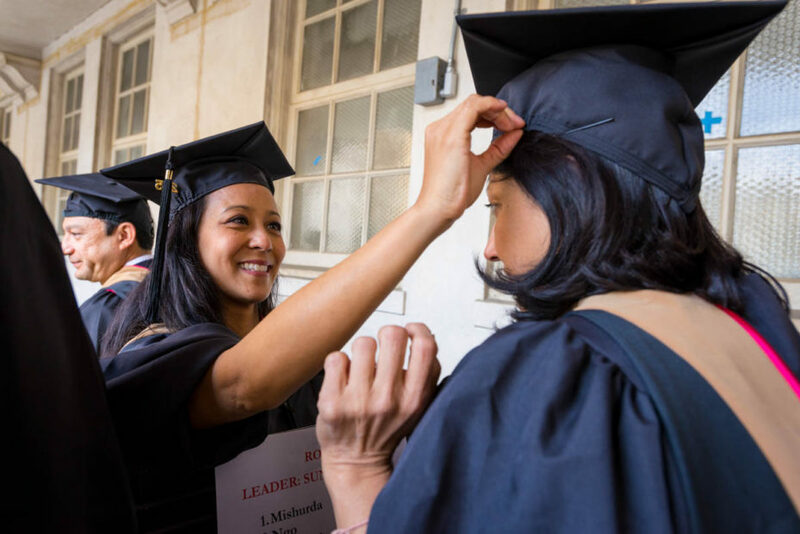 Here are a few tips to help you dress the part for graduation day, including how the hood is supposed to look. 1. Adjust the gown so that it sits comfortably on your shoulders. It should fall below your knee, but not so low that it is a tripping hazard. 3. Secure the hood so it doesn’t slip off. Use the cord on the front to secure the hood to a shirt button or use a safety pin to attach it to a blouse or dress. This will also give you a little breathing room so the hood isn’t tight against your neck. Fasten all hooks, buttons, and zippers securely. 4. Let your colors show. Turn the Penn colors outward to show the red and the blue, and roll the velvet edge out as well so that the inside colors show. When you’re done, the end of the hood will look somewhat like a fin. If you are an MBA student, ask someone to give you a hand with the cord and button in the back to keep your hood together. 5. Place the cap on your head so that point is lined up with the middle of your forehead. From above, it will look like a diamond shape. (The inside of the cap tells you which end is the front.) 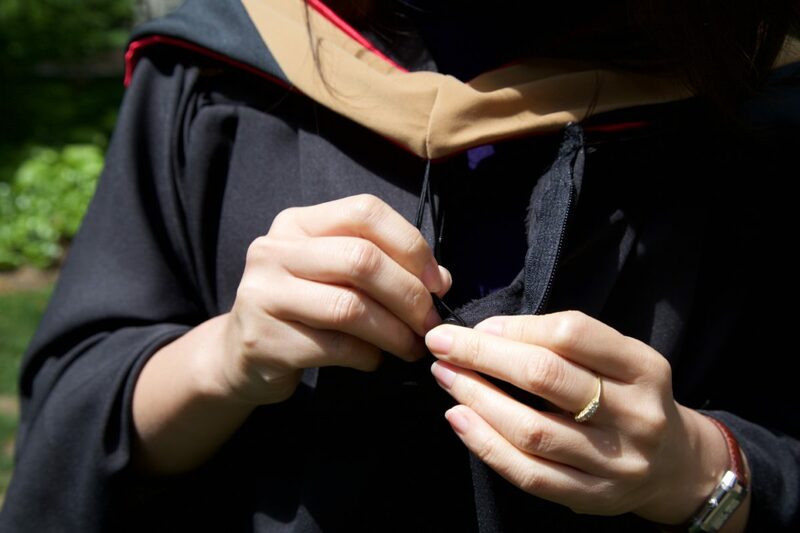 Adjust the mortarboard so that it’s parallel to the ground — don’t wear it to the side or to the back. You may need to use some bobby pins or clips to keep it securely on your head. 6. Fasten your tassel to the button on the top of the mortarboard. Put the tassel on the right side and don’t turn it until your degree has been conferred. 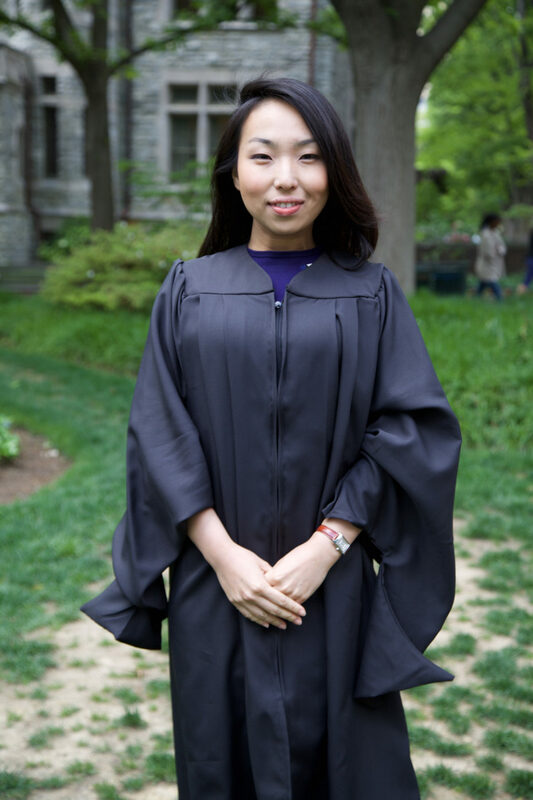 Congrats on finishing your Wharton career in style. 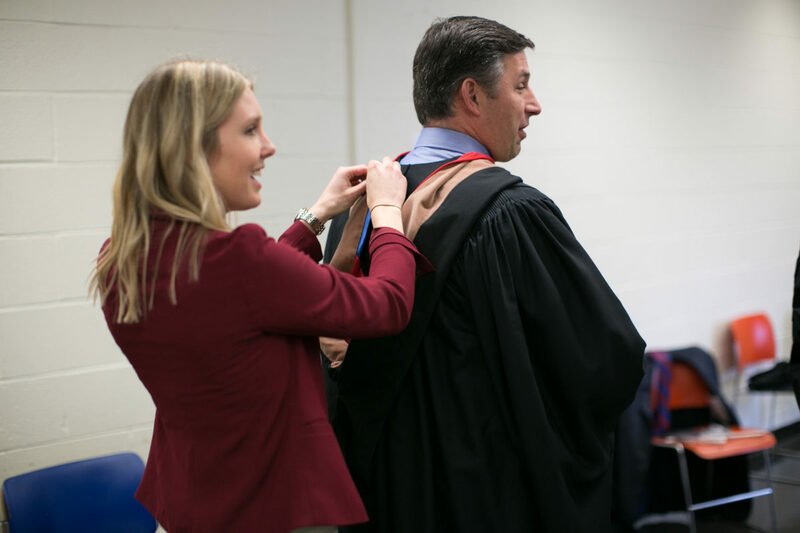 Doctoral students don’t have to worry as much about getting the hood right because their Graduation involves a traditional hooding ceremony. 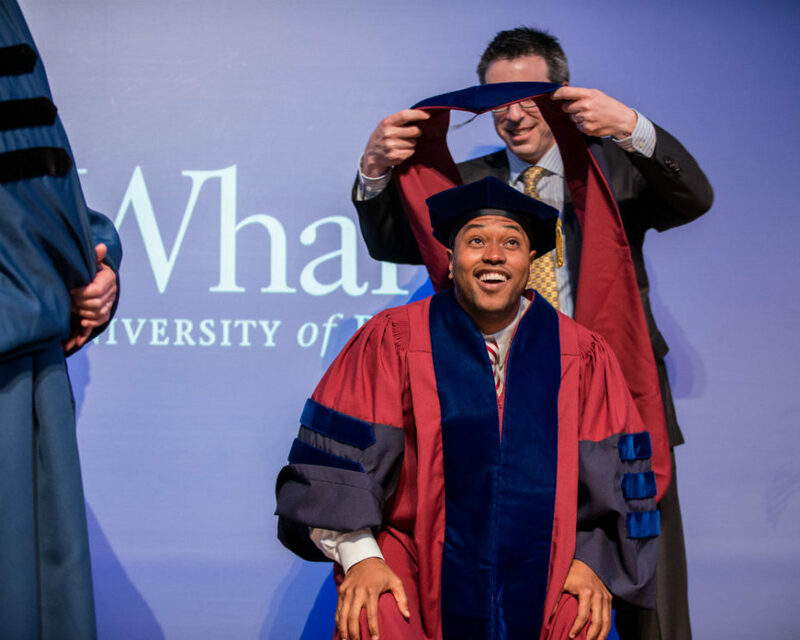 Each Wharton doctoral graduate is hooded by their faculty advisor, signifying their official transition and welcome into the academic community. 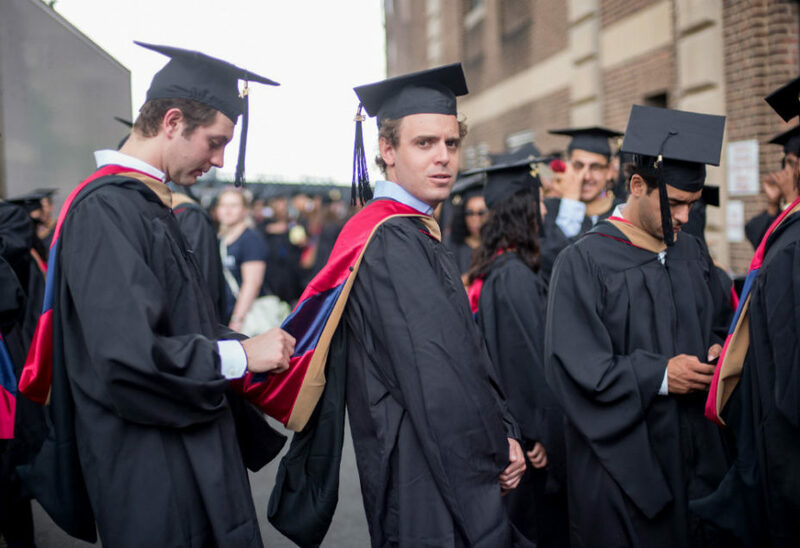 Visit graduation.wharton.upenn.edu for Graduation details, ceremony schedules, and links to view a livestream of the undergraduate and MBA ceremonies. 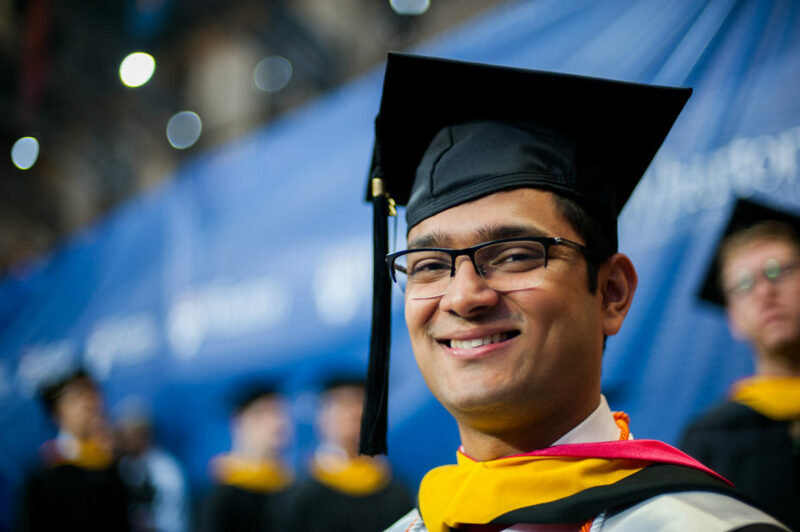 Use #WhartonGrad on Facebook, Twitter, and Instagram.